Biotinylated Influenza A [A/Hong Kong(H5N1)]HA1 (HA1-V82E4) is expressed from human 293 cells (HEK293). It contains AA Asp 17 - Arg 339 (Accession # AAC32099.1). The protein has a calculated MW of 39.6 kDa. The protein migrates as 45-65 kDa under reducing (R) condition (SDS-PAGE). 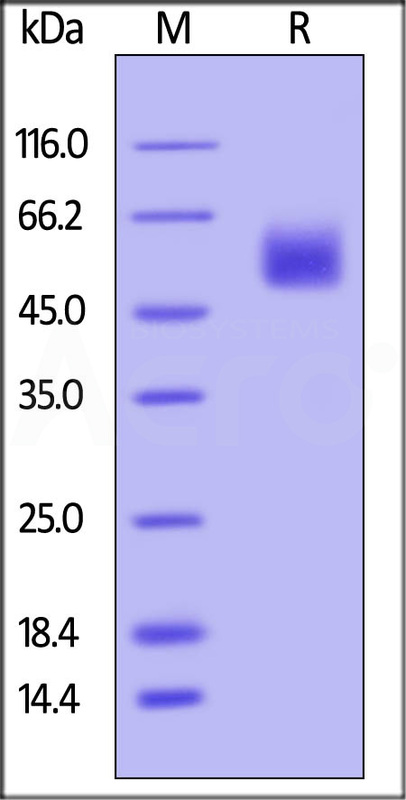 Biotinylated Influenza A [A/Hong Kong(H5N1)]HA1 on SDS-PAGE under reducing (R) condition. The gel was stained overnight with Coomassie Blue. The purity of the protein is greater than 95%. Influenza, commonly known as "the flu", is an infectious disease of birds and mammals caused by RNA viruses of the family Orthomyxoviridae, the influenza viruses. The virus is divided into three main types (Influenzavirus A, Influenzavirus B, and Influenzavirus C), which are distinguished by differences in two major internal proteins (hemagglutinin (HA) and neuraminidase (NA), which are the most important targets for the immune system. The type A viruses are the most virulent human pathogens among the three influenza types and cause the most severe disease. The serotypes that have been confirmed in humans, ordered by the number of known human pandemic deaths, are: H1N1, H2N2, H3N2, H5N1, H7N7, H1N2, H9N2, H7N2, H7N3, H10N7, H7N9. H7N9 is a serotype of the species Influenzavirus A (avian influenza virus or bird flu virus). H7 normally circulates amongst avian populations with some variants known to occasionally infect humans. An H7N9 virus was first reported to have infected humans in 2013 in China.